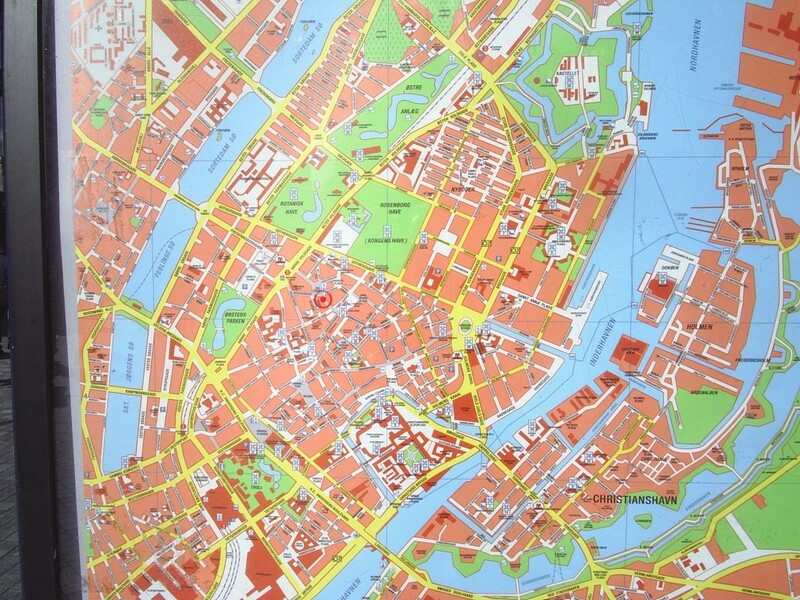 Copenhagen in 1600 century. 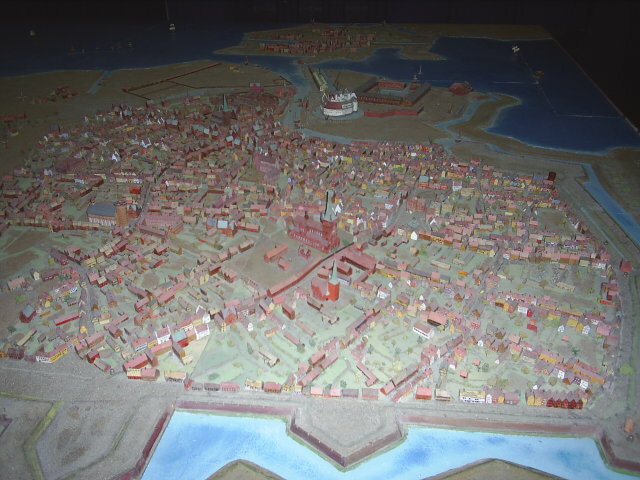 On top of the model is Christianshavn, a fortress and a city build by King Christian 4 about 1620 to protect Copenhagen Castle and city against invaders from Amager. 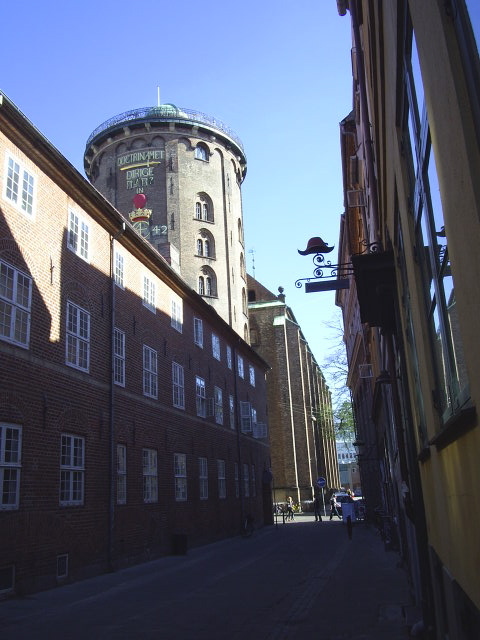 On Slotsholmen is Copenhagen Castle, Harbour for Surplies for the Royal Navy (Provianthavnen) and King Christian 4 Brewery (Christian den 4´s Bryghus). Up left is The royal Shipyard Bremerholm and more east Nyhavn, new channel for ships and trade. In the middle of the model: Old square with City Hall, The Cathedral Vor Frue Kirke build 1316 as a gothic Cathedral. 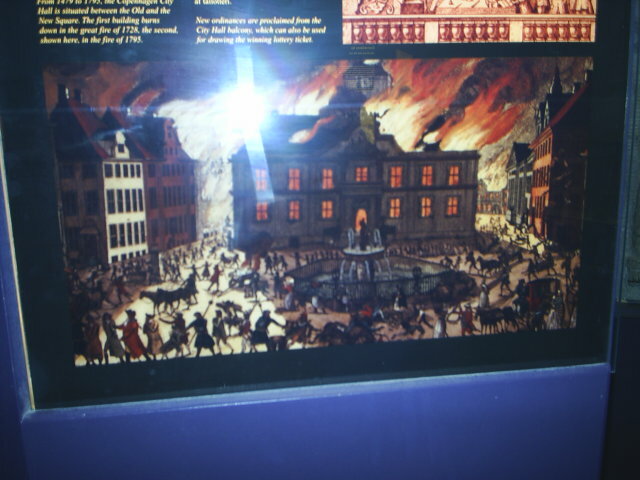 The Church with thousands of houses burned down under the large Copenhagen fire in october 1728. 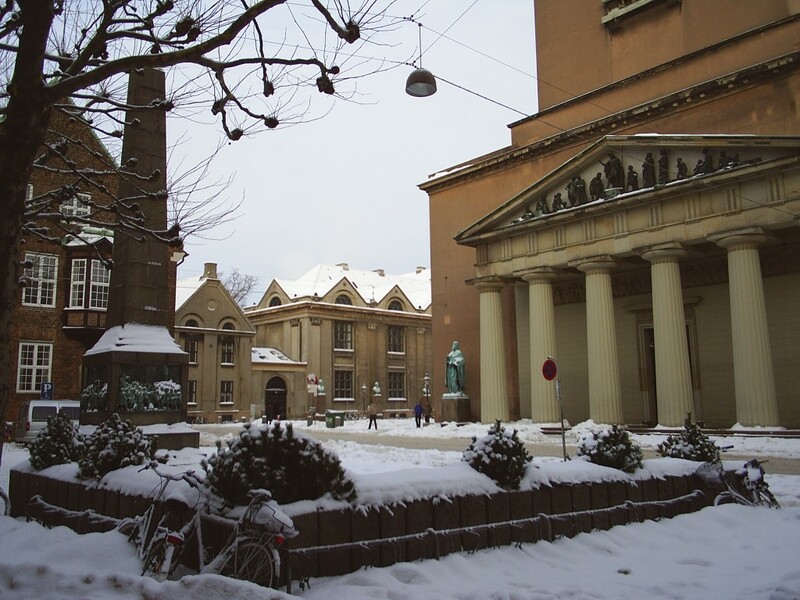 As neigbour Bispegården, University of Copenhagen founded 1479 and Sct Petri Church build about 1400. At left: Regensen, Rundetårn and Church of Trinity build 1630-42. Model in the Copenhagen City Museum. 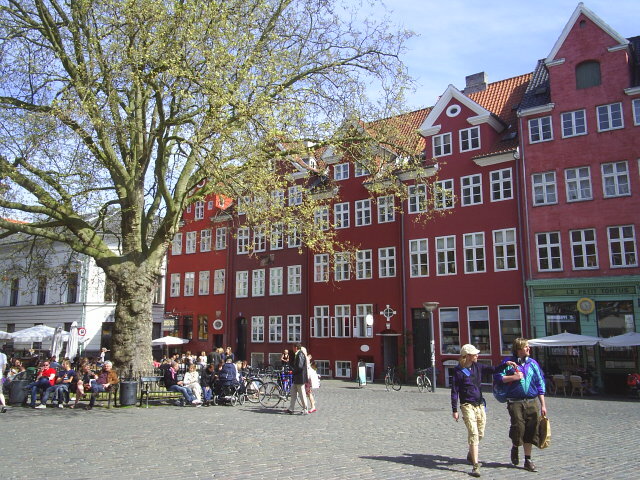 Our walk starts on the oldest Square Gammel/Nytorv, which has been the main marketplace since the foundation of the city. Law and order was enforced severely and the pillory and “Kag” stands permanently on the square until about 1768. Her stood the First City Hall, but was destroyed 1368 by invaders from Lybeck after siege and looting of the city. At the same time the invaders from Lybeck demolished The Castle of Absalon on the small island “Strandholmen” ( today named Slotsholmen) at the small sounds to Copenhagen. Two later City Halls were build on The Square but borth burned down – the third in 1728 and the forth in 1795. The place and size of them are marked on the Square. 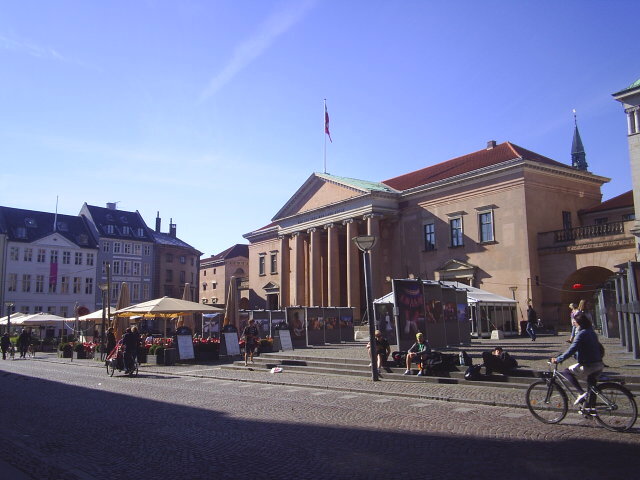 On Nytorv we stand face to face to a huge building Domhuset, Copenhagen City Court in style roman empire with 6 big columns, as a representation on the ruling power: absolute monarchy. 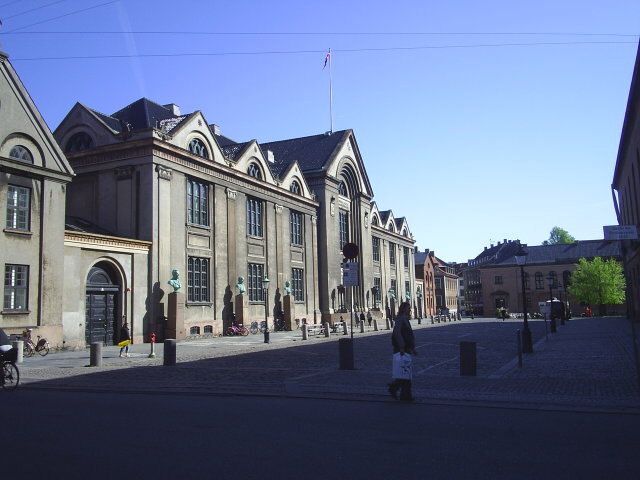 It started as Copenhagen City Hall until 1906, when the present Town Hall took over. Architect was C.F. 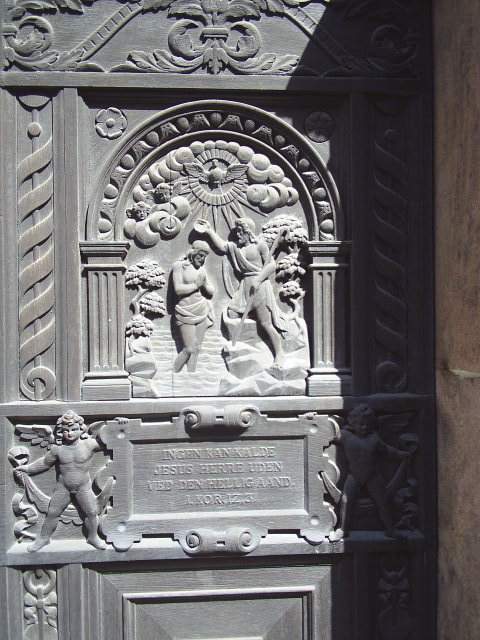 Hansen in 1799 – the same architect who builded the Second Christiansborg Palace and Chapel 1803-28 and the main Copenhagen Church “Vor Frue Kirke” form 1811-29. 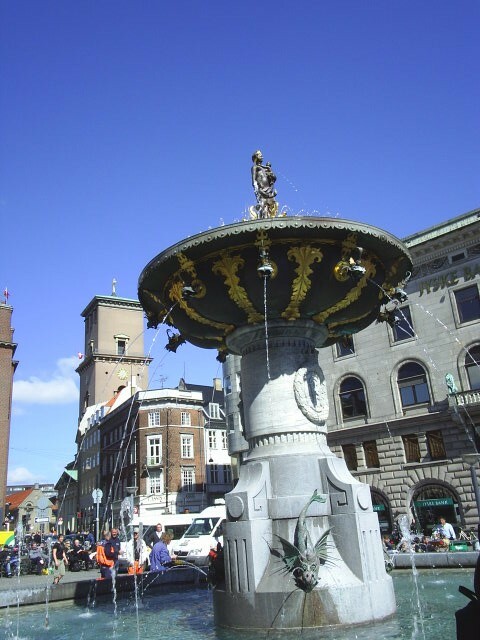 On Gammeltorv you will see one of the oldest and most beautiful fountains of the world: Caritas Fountain build by King Christian 4 in 1604. 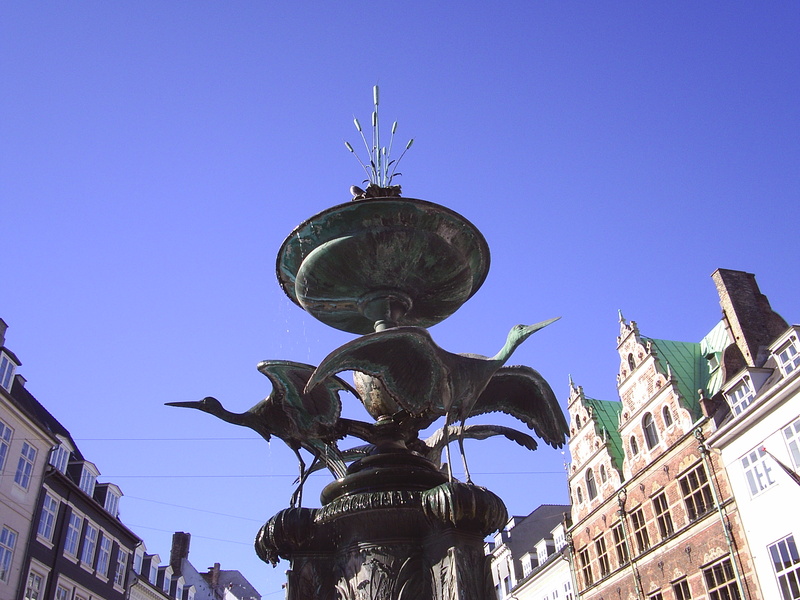 It was a gift to Copenhagen inhabitants for fresh water supply. The water was led from suroundings lakes and rivers north and east of the town: Sortedams-, Peblinge- and Sct. Jørgens Lakes through hollowing oak truks. 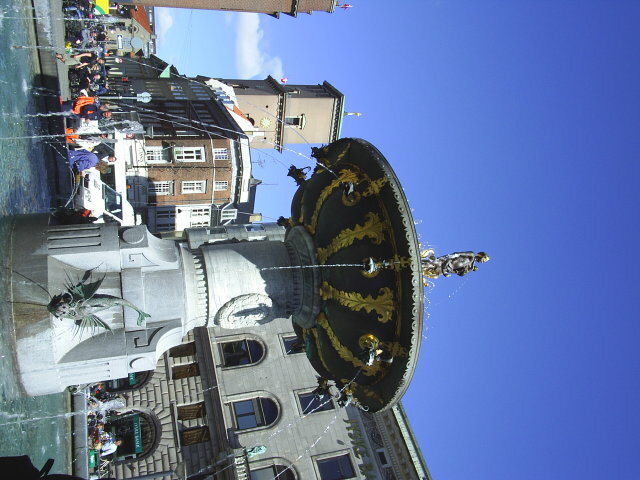 Caritas means Charity, which is symbolised by the female sculpture on top of the fountain with her child on her breasts. On the birthday of the Danish Queen Margrethe 2 the 16. april four gold aples springs on top of the fountains water “cascades”. Caritas Fountain, build 1604. 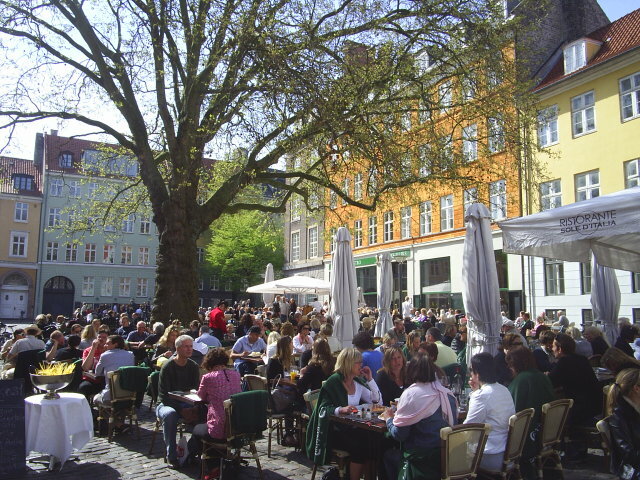 Gammel Torv, Copenhagen. 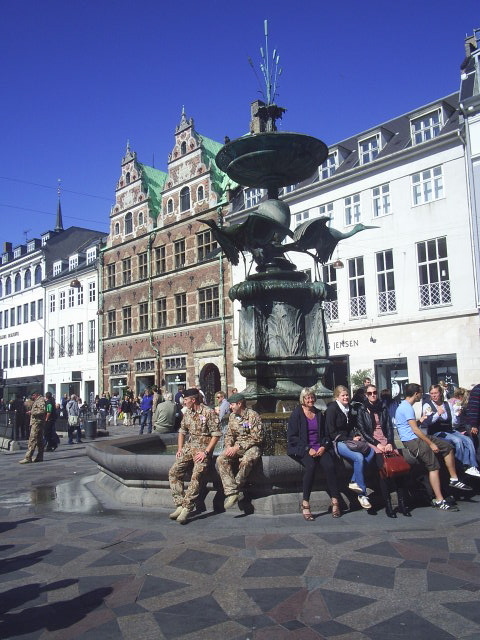 Photo: 16.april 2010 – 70 years birthday of Queen Margrethe of Denmark.You can see the aples of gold in the upper section of the fountain close to the sculpture. The scandinavians – danes, swede and norwegians had in The Vikings Ages 7-800 extensive commercial relations with the christian empires in West-, South- and Easteurope. It was a religion and culture collision of big dimensions. Even with big brutality of lootings and conquests. The Wikings came with their nordic god belief and experience in the foreign countries a different new religion based on One God, with grace and forgiveness, with a personal relation to af God of Trinity and with a future of eternal life. In next centuries a lot of Viking Chiefs joins the christian faith by baptism in Normandie, France, England, Ireland and Northgermany. It happens often under conclusion of peace after extensive lootings. The Vikings brought the christian faith to Denmark, Sweden and Norway. But it happens slowly – took hundreds of years. 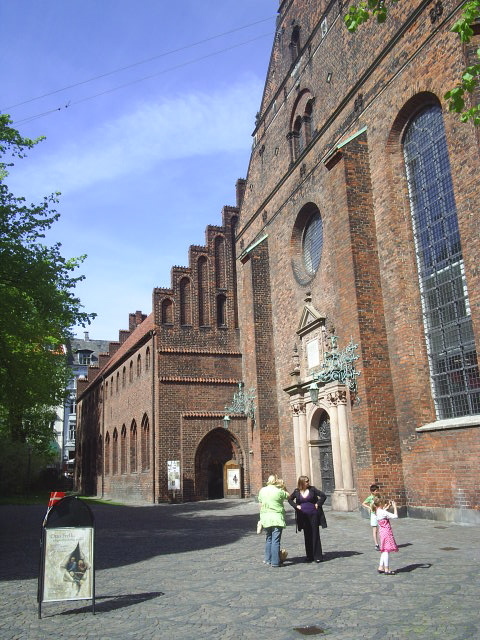 In 826 Denmark assigned the archbishopric of Hamborg-Bremen concerning christian mission. A Monk Ansgar (801-865) came the same year to Denmark with a newly baptised Danish throne pretender Harald Klak to propagate. 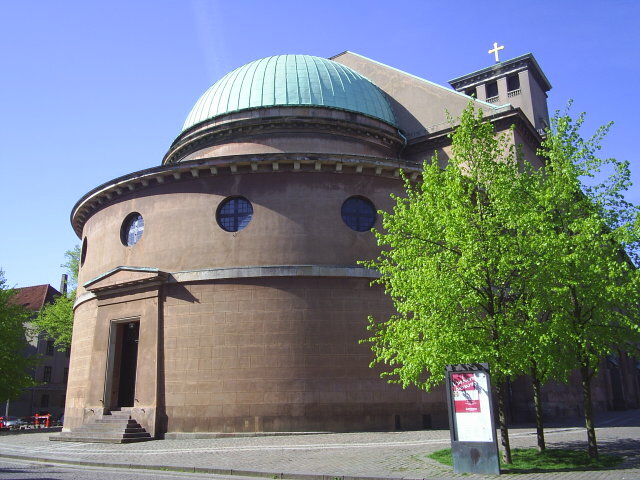 In 8-900 centuries a church were established in Hedeby by river Ejderen and in 948 the german emperor Otto den Store ordered bisperics in Slesvig, Ribe and Aarhus under archbishopric Hamborg-Bremen. Ansgar missioned not only in Denmark but traveled to Sweden, where he visited an old pagan worship place called Birka, close to todays Stockholm. 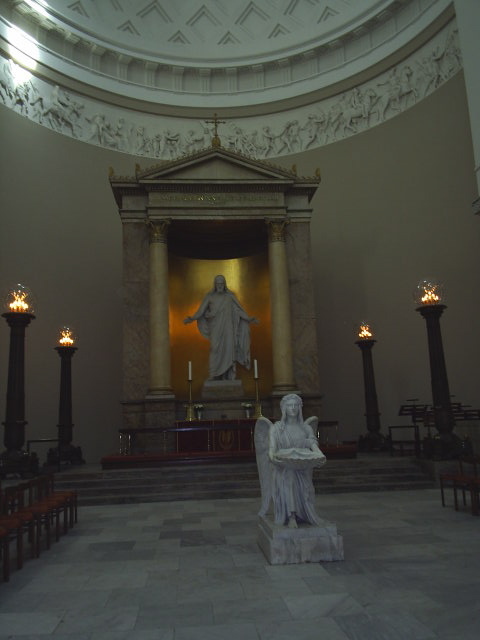 In Denmark excist the firt picture of Christ on the big granite stone called Jelligesten at Jelling Church in Jutland. The Danish King Harald 1. Blåtand made the stone to memorial of his parents Gorm the Old an Tyre about 870. King Harald 1. 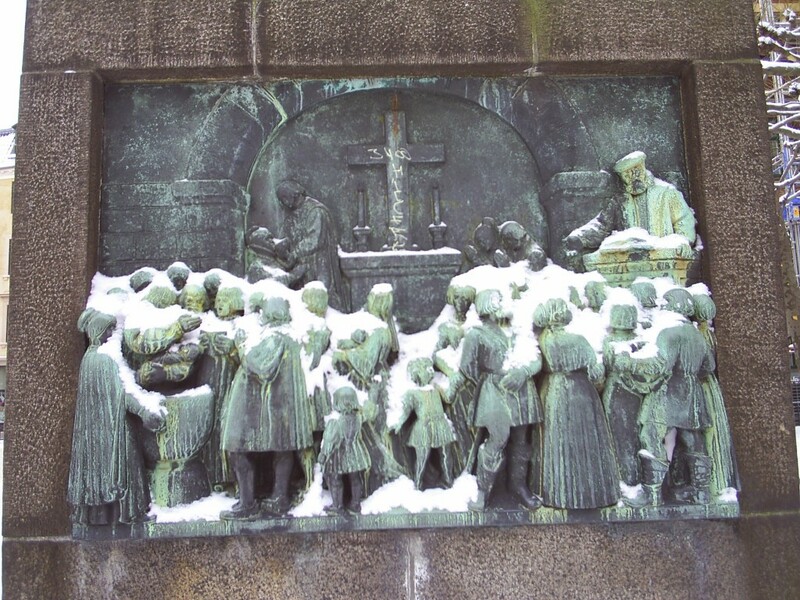 Blåtand were baptised by missionary Poppo in 965 and introduced christianity in Denmark under political pressure from the German emporer Otto den Store. Norway were christianized by King Olav Haraldsson by his returning from England in 1015. With him came a big team of english missionaries. Sweden were christianized as the last country in Scandinavia about 1100 when the last pagan cult- and worship place in Uppsala were closed. 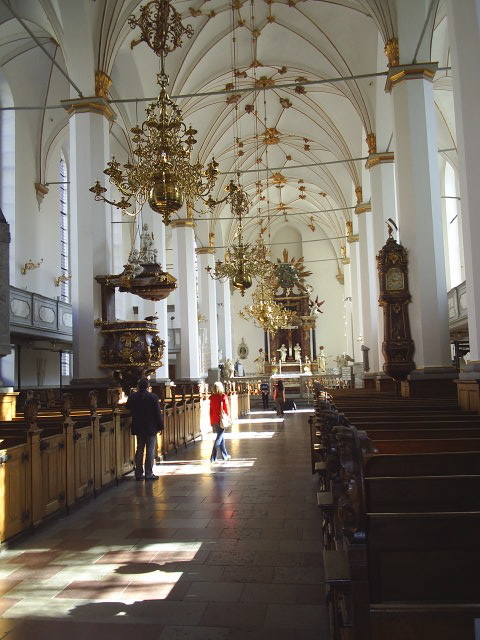 In all Scandinavia churches of wood and stone were build decorated inside with treesculptures and frescos. Inspired of immigrated monks and nuns social care houses, retreats and hospitals were introduced in all big cities. In Copenhagen a Monastery “Gråbrødrekloster” were established by monks at Gråbrødretorv in 1238. 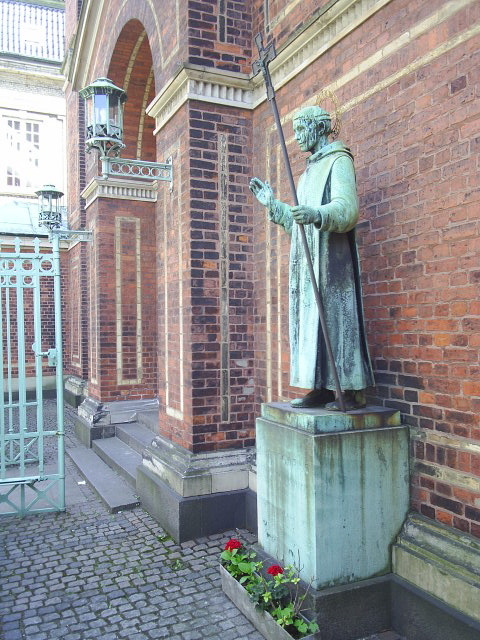 Monks of the order “Mendicant Friar” worked in the Monastery in the middle of Copenhagen until The Lutheran Reformation closed the work and the monastery down in 1530. Rebuild as a gotic church in 1469 from a ealier church build in 1300 century as part of an older monastry of Sct. Augustin. 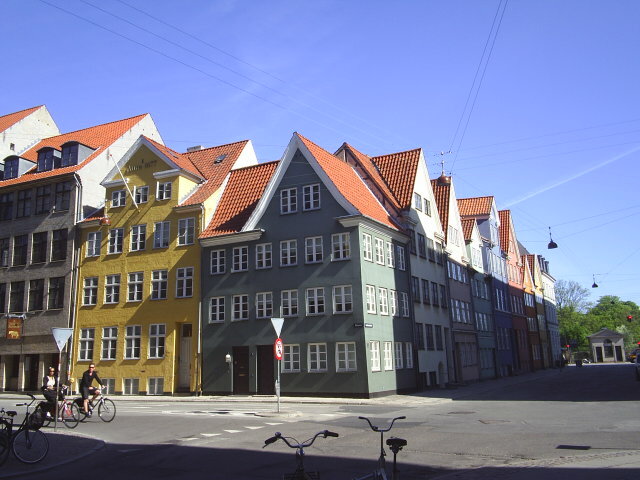 In 1296 a Helligåndshouse were build by the Bishop of Roskilde, who were the Ruler of Copenhagen. In 1419 King Erik 7. of Pommern became Ruler of Copenhagen and gave Helligåndhuset as a gift to a catholic monk- order “Duebrødrene” for nursing. In 1459 a Monastry Helligåndsklosteret were established. 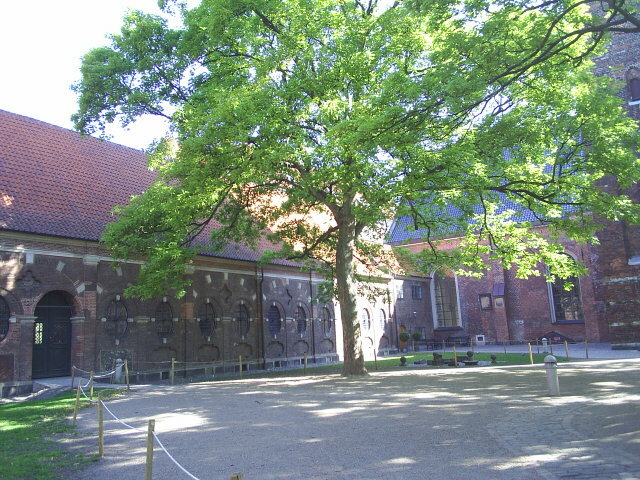 The western wing of this monastery are preserved until today as one of the oldest building in Copenhagen. Today its a book- and expedition place. 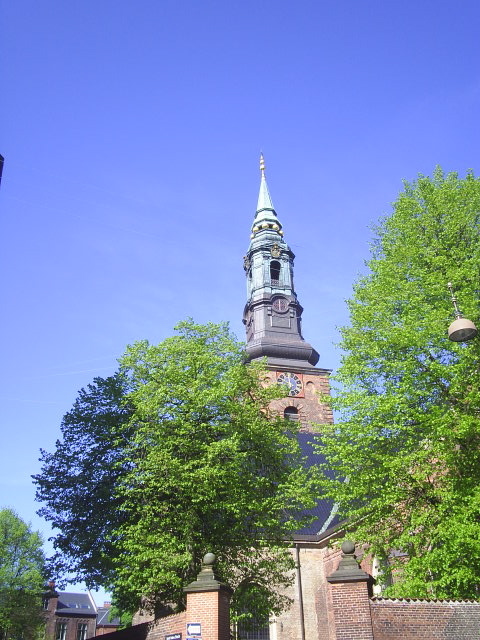 You can visit it as neigbour to Helligåndskirken. 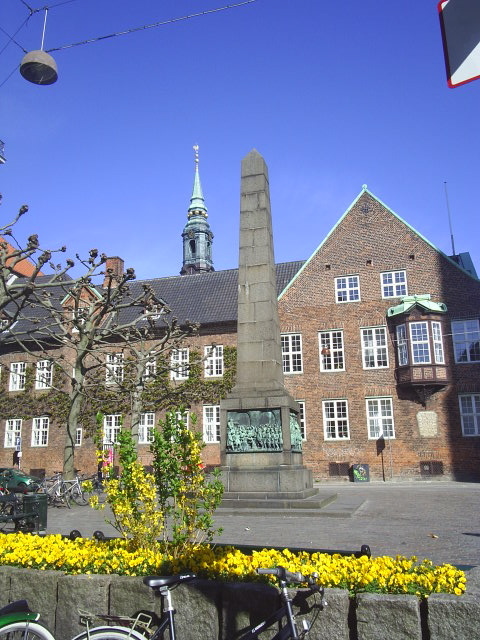 As neighbour to Helligåndskirken is“Strøget”, the main shopping walkingstreet and Amager Square, Amagertorv. Since 1300 it has been a marketplace with articles: fish, fruits, vegetables, butter, meat, cheese, chicken and eggs. In 16-1800 plenty of farmers from the island Amager came here to sell their goods. 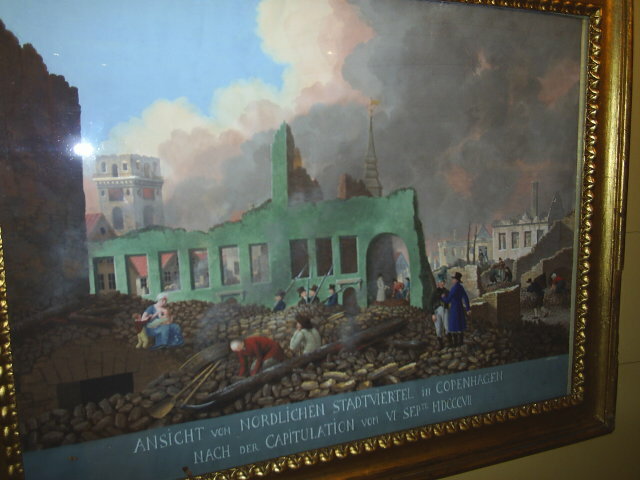 The large Copenhagen fire 5.-7. june 1795 destroyed all the beautiful renaissance houses on south part of Amager Torv. 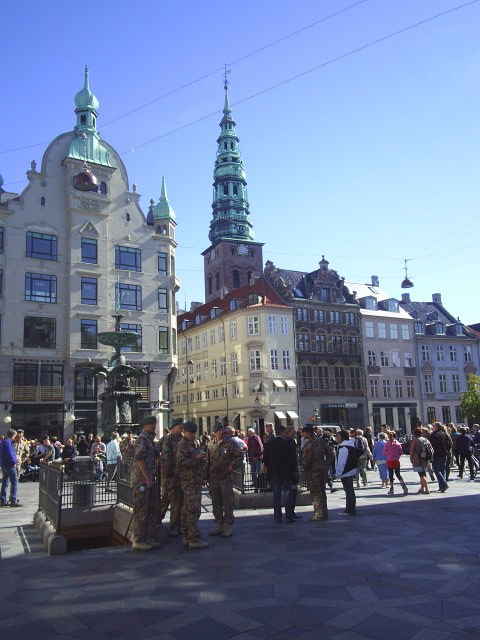 The fire started at the Dockyard at Gammelholm and spread to the tower of Nicolai Church, which collapsed and set on fire the neigboring houses at Højbro Plads, Gammel strand, south Amagertorv to Gammeltorv, where the fourth The Town Hall and the Vajsen Hous were set on fire. 941 houses and townfarms were destroyed. Storkespringvandet. Amager Torv. 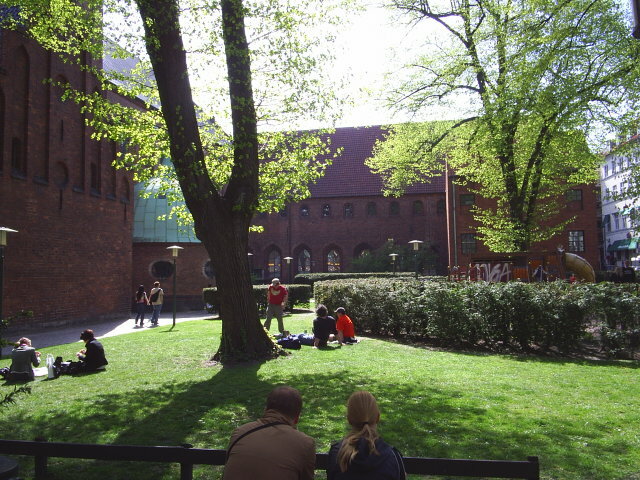 The red building in the background is Borgmestergården build 1616. We continue our walk to Købmagergade, another main shopping walkstreet. 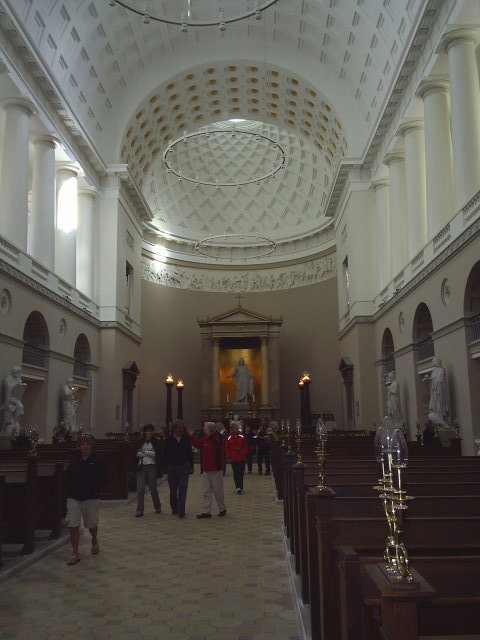 Here we visit a unique building complex from 1600. The tower is a cylinder 15 meter in diameter and 36 meter tall. Its build by small Holland bricks named “mopper”. 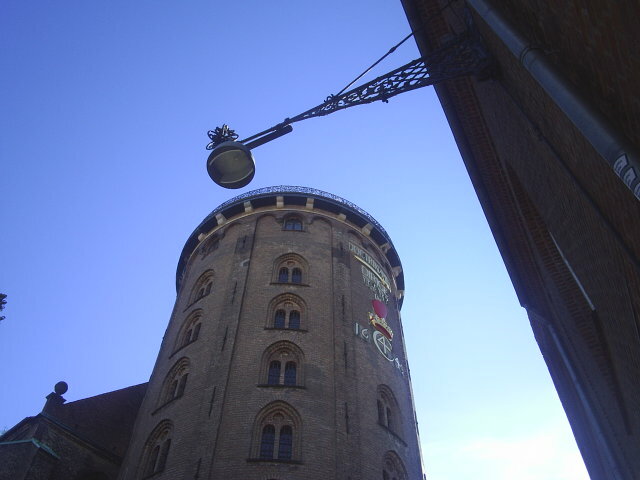 Rundetårn is build as a Observatorium to the new science founded by the famous astromer Tycho Brahe. Under the roof of the Church of Trinitatis a University Library were founded. On the outside wall of the cylinder of Rundetårn King Christian 4 created this decoration, a picture puzzle: ” Keep a check on doctrines (True christian doctrines) and justice (Justiam= a golden sword), LORD (JHVH), in the heart of coronated King Christian 4th.” 1642. 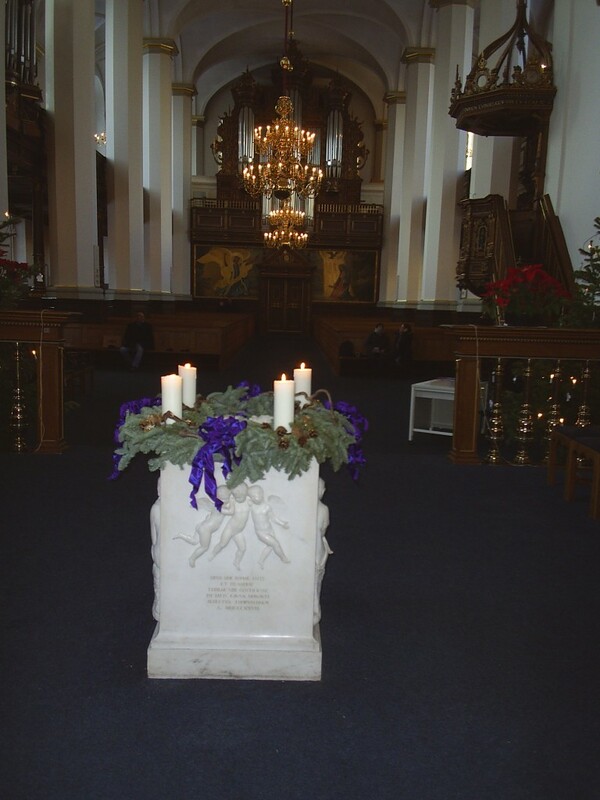 The style is inspired of barock, rich decorated with the Alter from 1731. 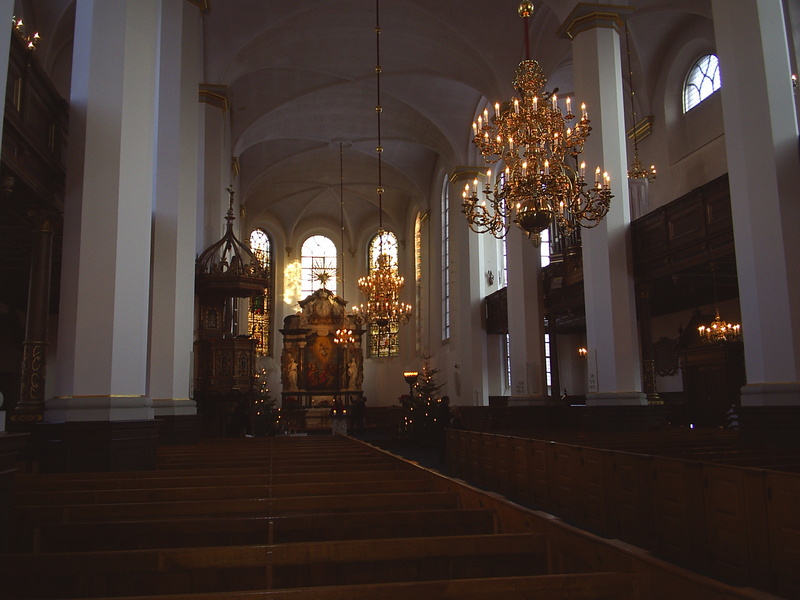 The large Copenhagen fire in 1728 destroyed the original decoration, but the church survived the bombardement of the English Navy over 4 days 2. – 6. september 1807. 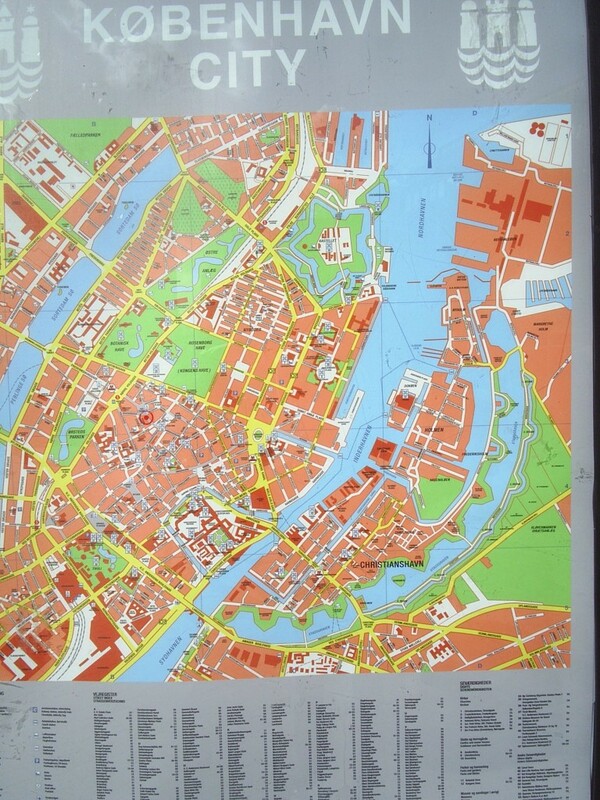 The rockets landed close in the quarter surrounded of the church. 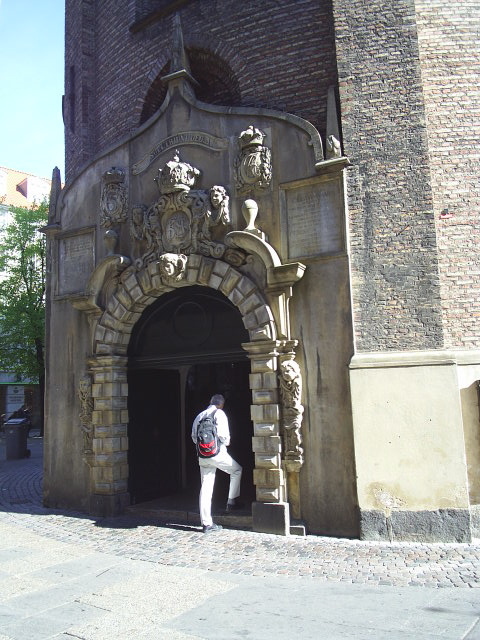 Regensen was destroyed and burned down to the ground in the large fire in 1728 – together with thousands of houses in the quarters from Royal Garden through Regensen to Vor Frue Church, a magnificent Gotic Church build 1316, which the fire destroyed totally.